During the few months leading up to the February 3rd Carve 4 Cancer Winter Sports and Music Festival at Blue Mountain the Carve team is in a state of organized chaos. Coordinating vendors, working with the mountain on final details, printing flyers, creating merchandise and doing everything else under the sun to make sure things go off with out a hitch. When Bobby Burt reached out to Carve 4 Cancer things seemed to stop for a moment. The 11 year old wrote an impassioned message to the team through our website. Bobby explained how he competed in a past Carve 4 Cancer rail jam (competing against some older kids nonetheless) and took third place. He told us about his passion for skiing and how he would be competing in the USASA this year. He ended his message by letting us know he spends summers in Italy where he would be more than happy to "sticker slap the entire country." Bobby Burt in his Carve 4 Cancer Hoodie with his little brother, Matthew. To say the Carve team was moved and inspired by the young man would be an understatement. Community Outreach director for Carve 4 Cancer, Aisling Carroll, swiftly organized a meeting with the little guy. Ais was blown away. She learned his Grandmother was a 22 year survivor of leukemia and that she got a bone marrow transplant from her sister in 1995. But more than anything she was impressed with his steadfast commitment to raising money and awareness on behalf of Carve 4 Cancer. "Bobby loves the Cause almost as much as he love skiing itself" Aisling said. "He is dedicated to getting his younger generation of peers involved in the cause and out supporting and raising money in a big way. Bobby will be an incredible asset to our team and we're lucky to have him on board!" Bobby doing what he does best. Bobby is currently in 6th Grade at St. Philip Neri Catholic School in Lafayette Hill, PA. 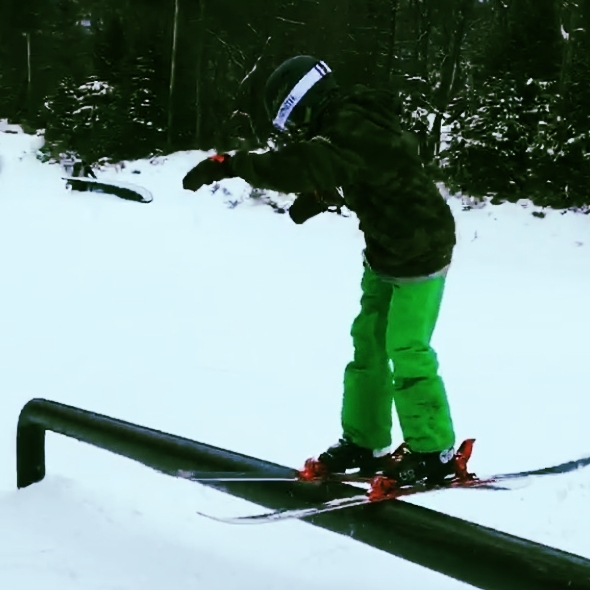 He started skiing when he was just 6 years old and started shredding the park when he was just 9. He has already raised well over $1K for Carve 4 Cancer and that's just the beginning. "I joined Carve 4 Cancer because I hope someday in my lifetime we will find a cure for cancer" Bobby stated. "I also joined because I want to help people while doing what I love to do, ski!" Bobby is now on the official Carve 4 Cancer Athlete Ambassador team and well on his way to being a serious fundraiser and contributor to the cause. The Carve Team has high expectations for Bobby and have very little doubt he will deliver. "It's fantastic to see a youngster like Bobby taking the initiative to join the fight against Cancer." Said Josh Frank, Marketing Director of Carve 4 Cancer. "Bobby is a perfect fit for everything our organization is trying to accomplish and I can't wait to see what this little dude has in store for us!" Newer Post10 Years Cancer Free - What a long strange trip its been. Older PostNew Carve Athlete Ambassador, Yassine Boundouq!